Strategic Vocabulary Instruction Through Greek And Latin Roots! Over 60% of the English language comprises words derived from Greek and Latin roots. 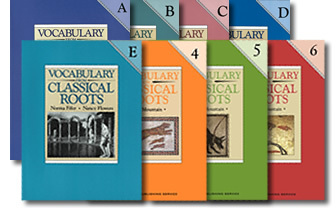 Vocabulary from Classical Roots is ideal for students mastering growing content-area vocabulary in social studies, science, and mathematics - predominantly multisyllabic Greek and Latin-based words. Vocabulary from Classical Roots helps students unlock the meanings of thousands or words. As students transition from learning to read, to reading to learn, they will develop a useful, transferable technique for making sense of unfamiliar words. "Students must be able to use common, grade appropriate Greek and Latin affixes and roots as clues to the meaning of a word. "~ Common Core State Standards for English Language Arts & Literacy in History/Social Studies, Science, and Technical Subjects. 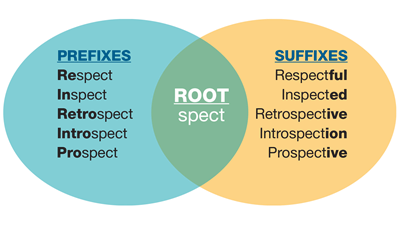 To View Vocabulary From Classical Roots Program Overview Brochure, click here.